Seen this afternoon on Weaver Drive in Virginia Beach at 1:15 P.M.: Newport News school bus #50. What was a Newport News school bus doing in Virginia Beach? Going into a residential neighborhood on a Saturday of a holiday weekend? I'm sure Newport News taxpayers would love to know. Patrick Muldoon Running For LG? When I got home from work this evening, I had a robocall from Patrick Muldoon in my voice mail. He's running for the Republican nomination for Lt. Governor, claiming Bill Bolling isn't conservative enough. 87% of voters want to keep Virginia Beach City Council elections in November, while 12% want to move back to May. The new poll is a non-political one: should college football hold a playoff? The last week of the Presidential campaign, Barack Obama came out for an eight-team playoff. In a 1990 letter to The Sporting News that was never published, I advocated an eight-team playoff. (Remember that the 1983 Miami Hurricanes went from 5th ranked to the National Championship.) Division I-A football is the only NCAA sport that doesn't hold a playoff for the national championship. However, some are still wedded to the bowl games and there's the BCS television contract to deal with. Hampton Roads Transit (HRT) will be holding a series of Open Houses as it conducts a Comprehensive Operations Analysis (COA). The COA will look at existing services and stops and consider how they could be improved. Okay, when was the last time you bought a record from the self-proclaimed "King of Pop"? (I haven't since I bought his Thriller album on cassette.) However, I thought you'd enjoy and Wacko Jacko is always good for some humor. I'll take the first shot: under sharia, don't they stone to death for what he does with kids? On Thursday morning the Transportation, Parking, and Pedestrian Committee (TPPC) of Virginia Beach's Resort Advisory Commission (RAC) met. The short meeting went only about 40 minutes. Hampton Roads Transit (HRT) had met with veteran drivers of the VBWave seasonal service to hear from them why they though ridership was down in 2008. First, there was less traffic on Atlantic Avenue, especially after 8 P.M. Second, many didn't grasp the hybrids being the replacement vehicle for the trolleys and would stand at a bus stop waiting for one of the red vehicles. On the bright side, the new routing north of 25th Street worked well, while bunching was only a problem on major holidays. Parking lot collections were down slightly in 2008 due to a rainy September. The lots were ahead by about 20,000 vehicles and $100,000 going into September, only to have it rain 11 of 30 days. However, the elimination of Camp Pendleton shuttle service on major holidays (which was paid for out of parking revenues) meant net revenue was actually up for the year. In the ongoing 16th Street saga, Plan C is now to cul-de-sac 16th Street in the 400th block, the second time the proposal has been pushed back a block. In addition, traffic calming measures are suggested on Arctic Avenue in the neighborhood. This coming Tuesday proposed revisions to the Residential Parking Permit Program will go to City Council. Now that I have StatCounter installed, I can see that the 4th largest ISP for hits to this blog is the City of Virginia Beach. 7% of all hits are coming City computers. The next time critics try to dismiss this blog, please note those writing policy are obviously reading. The User Citizen Advisory Committee (UCAC) of Hampton Roads Transit (HRT) met Wednesday evening at HRT headquarters in Hampton. Tom Holden gave a report on the Freedom of Information Act (FOIA). UCAC Chairman Henry Ryto had requested it, wanting UCAC members to be aware of their obligations under the statute. An update was given on pending changes to the UCAC Guidelines. By consensus the name Transit Rider Advisory Committee (TRAC) was accepted. The previous recommendation of Passenger Advisory Committee (PAC) had been rejected by HRT Staff, as it used the same acronym commonly used for HRT's Department of Public Affairs and Communications. UCAC Staffer Tamara Poulson covered incident reporting procedures. UCAC members were asked to follow the template used by HRT's Customer Service Department. Staff had a full set of answers for the questions submitted by UCAC members in their City Reports. Some HRT reports were distributed to UCAC members. The ridership report showed that ridership in October was up 8.86% over October, 2007. The next UCAC meeting will be Wednesday, December 17 at 6 P.M. in the Norfolk office. There the UCAC will do Strategic Planning. In our latest poll, 84% backed Virginia Beach looking at a regionalist approach to local issues. 15% wanted to go-it-alone, but that's a dinosaur that demographic changes will eclipse. According to the U.S. Census Bureau, fewer Whites lived in Virginia Beach in 2007 than in 1990. What population growth we had during those 17 years was entirely minority, mostly former Norfolk and Portsmouth residents. Given their ties to their former communities, there's a different mindset towards Regionalism. Despite the futile efforts of some VBTAers to cobble together an artificial Virginia Beach-Chesapeake MSA (in an attempt to secede from the region), Virginia Beach policy will become further fixed westward (not southwestward) with time. Regionalism is a historic inevitability. The new poll question: which date do you prefer for Virginia Beach City Council elections? What Next For Obama's Organization? Having given a small amount of money ($25) to Barack Obama during the Democratic primaries (obliterate Hitlery! ), I'm on the Obama e-mail list. This morning I got an intriguing e-mail. It was an e-mail with a link to a four page survey. It appears that the Obama campaign is looking to morph into a permanent political organization. It would not only support Administration policies, but field state and local candidates. How would the new organization interact with the existing Democratic Party structure? The only campaign in memory I can remember doing anything like this was Pat Robertson's failed 1988 Presidential campaign, which became the Christian Coalition. Now that the short lady is on her way out the City Hall door, it's appropriate to consider how Virginia Beach should remember her. Here's an idea I first tossed out three years ago: rename Central Library after her. Prior to her 32 years on City Council (the last 20 as Mayor), Meyera Oberndorf served on the Library Board. In addition, she's served as the Council Liaison to it during her tenure on City Council. Given her longtime advocacy for the libraries, it would be fitting. Is Cumulative Voting An Alternative? Today's Virginian-Pravda brings us the story on how Virginia Beach's African-American community leaders are discussing the need to change our City Council electoral system http://hamptonroads.com/2008/11/virginia-beachs-black-leaders-discuss-shift-voting-system While a change is needed, what next? A cumulative system in Virginia Beach would mean 5 Council seats up every two years. All candidates would run in a single field, with the residency districts eliminated. Voters would have 5 votes (or points) to cast across the field in whatever manner wished. The top five finishing candidates would win Council seats. Why cumulative? First, none of the publicly stated reasons for opposing a ward system apply to it. You would still vote for everyone, have to see the City as a whole, there are no districts that could become fiefdoms, etc. Second, it's harder to go negative in campaigning when it's everyone against everyone. Third, the neo-proportional nature would provide for a more diverse Council (in more ways than one). While my personal preference is for a ward system, I've long pushed cumulative voting as a possible alternative. With electoral reform on the front burner, I thought I'd toss cumulative out to get it on the table. We can always count on the Virginia Beach Taxpayers Alliance (VBTA) for political myths. One of their newest was spewed by Reid Greenmun on hamptonroads.com on Saturday: 61% voted against Will Sessoms, so he doesn't have a mandate. http://hamptonroads.com/2008/11/virginia-beach-sounds-retreat-voter-turnout I saw the same line in the Comments section of a Virginia News Source letter a few days ago. Therefore, I wish to dismantle the myth. 1. Economic development - financial facts (i.e. dipping assessments, state budget cuts, etc.) are going to curb any large spending spree. 2. Resident involvement - here's where the 39% kicks in: Sessoms is going to need to reach out to Oberndorf and Taylor voters. If not, he faces being a one-termer and/or seeing his allies routed in 2010. The irony is that fiscal and political realities are going to push Sessoms towards a policy line closer to Taylor's platform than what he himself ran on. So how does Sessoms build a new majority? The key player is Glenn Davis. Remember that Davis won election with a coalition that had at it's core the duo of the Chamber of Commerce and the African-American Political Action Committee (AAPAC). A business community-minority communities alliance would not only be formidable, but open the door for a full-blown political realignment. Give Davis a high-profile role in dealing with the public. As trolley replacement in Virginia Beach is going slow, Hampton Roads Transit (HRT) has had to use a hodgepodge of equipment to keep the outlying routes rolling. Opuses were brought in when Norfolk's hybrids arrived, and some small buses even came from the Peninsula. The idea was to avoid using the remaining trolleys. Among the buses from the Peninsula were two ad buses. They are painted a red-orange color for the Virginia Lottery. Bus 1500 was nicknamed "Clifford" by a Beach-based driver. Clifford is named for the reddish cartoon dog. With the Summer season over, HRT has been able to put the 10 existing hybrids onto mainline service. That has allowed it to...uh...send Clifford to 18th Street (Southside garage). Last night I spotted Clifford coming into the Cedar Grove Transfer Center. I text messaged HR Transit Ideas' Michael Ragsdale "Clifford on Inbound 23". Michael immediately called to verify that it was Bus 1500. (Bus 1503 looks similar). Any TCC students wishing to visit their old friend Clifford, take the 25 to Military Circle, transferring there to the 20 or 23 to go to Cedar Grove. Arriving in Portsmouth about 90 minutes ahead of Michael, I went a half-block to Portsmouth's main library. I had been there twice before. The building itself looks nice from the outside. Inside, it's small by the standards of main libraries in Hampton Roads. We have a few branches in Virginia Beach about the same size. The amusing thing was their Internet computer system. Only 6 computers are available, but the highlight was the registration system they used. The Pharos program has you register on an unit at an adjacent table. Your name then goes into the queue. A monitor displays the names in order with the estimated wait time for each. When your unit opens up, the monitor tells you which unit to report to. It's similar to an airport flight display. The Nanny State Goes "Quack!" Not only have I fed ducks before, but I fed seagulls at the beach while growing up. The City doesn't like the diet? Elsewhere I've used machines that dispensed corn for feeding ducks with. If the City did that, not only would the ducks and geese get fed a healthy diet, but it would become a small revenue source. Alaska prohibits feeding moose, as the large animals roaming into residential areas poses a public safety issue. However, ducks and geese? First, does anyone seriously think the Obama Administration Justice Department would grant clearance to go back to May? Not only would it mean cutting turnout by at least two-thirds, but November meant a large minority turnout we hadn't seen in May. Second, they're making the huge mistake about this election that I predicted shortly after the change. Don't learn too many lessons from November 4! In November, 2010 there will be neither a Presidential nor Senatorial race on the ballot. Therefore, turnout should be 40-45% rather than the 70% we just saw. With Jim Glynn moving up, John McMullen will serve the final year of his Director's term. Entering the second year of Director's terms are Chris Wiemken and Jay Kerr. Chandler Scarborough will continue to serve as Past President. This morning I completed a "get around to it" project: switching from Bravenet to StatCounter as the hit counter for this blog. It's a much better service that is free, just like Bravenet. StatCounter was already in use by 757Hampton Roads and HR Transit Ideas. The Peninsula Institute for Community Health (PICH) will be opening a clinic in Virginia Beach "after the first of the year". It will be in the former Oceana Urgent Care building on General Booth Boulevard. PICH offers medical and dental services primarily to low-income people. Based in Newport News, they already have satellite offices in Mathews County and Suffolk. There is a three-tier fee scale, with payment dependent on income. While medical only will be provided in Virginia Beach at first, the PICH administrator I spoke to this afternoon left the door open that they may add dental at the Beach later. I've been talking about this off-and-on for 5-6 years now. Virginia Beach is in a strategic political impasse which has crippled this City Council and the two previous. There are those who think simply putting Will Sessoms in the Mayor's office will break it. While Sessoms will be more aggressive in pushing agenda items, swapping out Mayors won't mitigate the political fallout from actions. In fact, this election no opposed incumbent got a majority of the vote. At least 7 district seats; you really need 8-9 districts to make the numbers sing. Add all the at-large seats on top of that you want. It would mean a larger Council, but a larger Council would mean a smaller workload for each member. If you go to a ward system, the Mayor needs a veto to prevent the Balkanization of the Council. As he'd be elected at-large, he can block a tyranny of the majority. Not only do I not personally like the idea, but Virginia's new eminent domain law limits the utility of one. However, I need something to horse trade for a ward system. The current SGAs avoid healthy existing neighborhoods, while promoting redevelopment in the SGAs along the Norfolk Southern Corridor strengthens to case for light rail. Grudgingly offer it in return. 4. Raise the amount of debt the City can issue annually. The current Charter limit is stuck in 1963 dollars. Needless to say, 45 years of inflation have left the figure silly. Both the U.S. and Virginia Constitutions have one, but not our City Charter. I know I'll get shot at from some quarters for some of the specifics I mentioned. However, to pass a new Charter at referendum (which the General Assembly will almost certainly require), there needs to be something for everyone to vote for in the reform package. With the election over, I thought I'd toss the idea out for discussion. Don't like something? A suggestion for addition? 56% of you voted to use the Rooms Tax in part to finance the next phase of Town Center. I wouldn't seriously consider it. With a recession looming, Rooms Tax collections may very well go down. If so, the Town Center receipts will be needed to help cover current obligations. Since I'm going to Newport News today, I thought I'd ask a question regionalist in nature. Which way should Virginia Beach policy lean: towards Regionalism or should we go it alone? The Virginia Beach City Council election is over, and Virginia Beach Taxpayers Alliance (VBTA) Chairman John Moss finished with only 15.71% of the vote in the Mayoral race. Things get even more grim for the VBTA when you see that Leona Shuler got only 8.07% in the Council At-Large race. The true believers were routed: Libertarian Bob Barr received a minuscule 0.31% of the Presidential vote. The pipe dream of a VBTA electoral breakthrough is simply Deanlusional. Having been schooled by both the Republican Party of Virginia (RPV) and GOPAC (a big, national Republican PAC), I know coalition building is a vital part of winning elections. GOPAC teaches a model where you shoot for a coalition that will get you 52% of the vote. You can't build a 52% coalition around the far right-wing VBTA. In fact, their idea of a coalition is the VBTA, the Tidewater Libertarian Party (TLP), and the Citizens Action Coalition (CACI) together. Honestly, who in Virginia Beach is looking to go into coalition with the VBTA? First, they're so far to the right that you can't build out a coalition far enough to the center off them to win. Second, their obsession with reducing the Property Tax rate is an albatross that drives off potential partners. 1. The Marian Manor breakfast group is their sounding board. They believe that the Kool-Aid chuggers actual reflect the community. 2. They delude themselves into believing that disagreement with City policy and support of the VBTA agenda are synonymous. 3. When their candidates and door knockers hear discontent, they assume their candidate is winning. 4. Their candidate - inevitably - gets clobbered. Moss' clobbering is the beginning of the end of the VBTA. They were shown to be political impotent, and all the Viagra in the world won't get them going again. What's left of the VBTA, if it can ditch it's extremist Officers, has a potential life as a junior partner in City conservative and center-right coalitions. However, VBTA City Council candidates will never be a serious threat again. The TDCHR reconvened this morning for Day 2 of their annual Retreat. Things began with a recap of yesterday's proceedings. 1. Promote and Advocate Transit-Oriented Development in Hampton Roads. 2. Make Hampton Roads Transit a Transportation Provider of Choice in the Region. 3. Achieve Financial Stability & Efficiency. 4. Develop a Workforce that is Highly Qualified, Efficient, and Motivated by Excellence. 5. Increase and Improve Capital Assets. No one had any major problems with the Business Plan. Under Governance, the focus was on committee structure and function. With 9 existing committees, consolidation of three of them was considered. Today I was given the opportunity to participate in the full session with the Commissioners and HRT Staff. I'd like to thank HRT for that and two good meals. On Friday, 2WD (101.3 FM) went to an all-Christmas music format. On November 7. Why that far out? Some Christmas music is okay a couple of weeks out. Furthermore, as a Catholic, let me point out Easter is the more religiously significant holiday. Therefore, I won't be tuning in 2WD again until after Christmas. After completing this morning's TDCHR meeting, the tables were reset for the annual Hampton Roads Transit (HRT) Retreat. The TDCHR reconvened, with five major areas covered on Friday. It started with an overview of the Fare Policy document being drafted. The big item: the consultant suggested that HRT peg it's fares to the Consumer Price Index (CPI), with annual increases based on the CPI figure. The TDCHR will take up the proposal at a later date. A briefing was given on the Comprehensive Operation Analysis that is in progress. The Hampton Residential Services, seasonal bus routes targeted for middle and high school students, will be discontinued no later than June, 2010. HRT is one of seven transit agencies in the country that offers a product aimed at students. Not only have Federal Transit Administration (FTA) regulation changes made it more difficult to operate, but capital needs to keep it's older buses running make it cost-prohibitive to continue. The proposed Strategic Plan was covered. It's a series of principles and measures for operating HRT. Commissioners wanted to spend little time on it, as what's in it are common sense things that - Randy Wright noted - HRT should already be doing. The session ended at 4:15 P.M., a half hour earlier than scheduled. The TDCHR reconvenes at 8:30 A.M. for another half day of the Retreat. On the Agenda are the Business Plan and Governance Issues. Over 27,000 absentee ballots were cast in Virginia Beach for this election. Counting was finally completed today. Will Sessoms replaces Meyera Oberndorf as Mayor, while Glenn Davis defeated Reba McClanan in Rose Hall District. The new Council should be great for the Resort Area and very good for light rail. Watching Council after New Year's should be fun! This morning the Transportation District Commission of Hampton Roads (TDCHR) held it's November meeting. Hampton Roads Transit's (HRT) governing body was delayed 35 minutes as late arrivals were needed to muster quorum, but then the meeting itself lasted only 20 minutes. 7 contracts were covered: 5 Change Orders for light rail, 1 new contract, and 1 contract extension. Three of the Change Orders actually lowered the cost of the project, by a total of $1,939,366.00. The TDCHR adopted it's 2009 Legislative Package. Among it's requests: a dedicated funding source, additional funds for hybrid shuttle vehicles, and money to cover further study of light rail. For the first time since I've been attending TDCHR meetings, HRT has no vacant full-time bus driver positions. There are 4 part-time vacancies in Hampton. Finally, the location and time for the December TDCHR meeting has been changed. It will now be December 11 in Norfolk at 10 A.M. The change was requested by the City of Norfolk due to light rail eminent domain hearings that day. This afternoon Virginia Beach's Resort Advisory Commission (RAC) held it's November meeting. It was a short session, going only about 35 minutes. Oceanfront Enhancement Committee (OEC) Chairman Jim Davis labeled the Transportation, Parking, and Pedestrian Committee's (TPPC) plan for the 16th Street area a "good compromise". The plan would cul-de-sac 16th Street just west of Arctic and implement traffic calming measures on Arctic in that area. The OEC has now requested that the neighborhood's civic league gather petition signatures in support. In addition, the OEC is discussing signage to create a "sense of arrival" into the Resort Area. That led Staff to bring up that the entertainment RFP includes a solicitation for "creative ideas" on such. The deadline for proposals under the RFP is November 18. In the works is a demonstration for LED lighting along the Boardwalk. Four fixtures will be used to test the concept. RAC Chairman Ken Taylor and Vice Chair Gerrie West were reelected to the same posts for 2009. Finally, CVB Director Jim Ricketts noted in his remarks that Tourism didn't become a large issue in the just-concluded City Council campaign. It was anticipated that VBTAers would try to run against the Oceanfront. 1. The most interesting fact: no opposed Virginia Beach City Council incumbent has a majority of the vote. Diezel is at 48.85%, McClanan is at 46.31%, Wilson is at 43.16%, and Oberndorf at 33.93%. Political thought is so splintered in Virginia Beach that no incumbent has the support of a majority of residents. As the new Council goes to move forward, that's well worth remembering. Major initiatives will require fluxing coalitions and plenty of ground work. 2. Once I get John Moss' final tally, I'm changing my blog banner. The new slogan will be "(83.86%) of voters rejected the Virginia Beach Taxpayers Alliance (VBTA) and it's extremist agenda." 3. I hope Joe Flores enjoys his pieces of silver for being Harry Diezel's splitter. 4. My personal little joy: here in Aragona Precinct Georgia Allen defeated Rosemary Wilson 50.81% to 30.99%. 5. If it's any consolation to Meyera this morning, she did win here - barely. Share your comments and observations. I plan to be back on here this evening as the returns start to come in. BTW, on Sunday evening I outlined my post-election post ripping the VBTA if John Moss tanks as expected. 6:23 P.M. - downstairs having dinner, it occurred to me to make a bold prediction: no matter what the election results tonight, Reid Greenmun will be complaining that the new government isn't far enough to the extreme right. 8:47 P.M. - With Obama up in the Presidential race, celebrations have already started in our apartment complex, which is about 85% African-American. Pots are being banged on; one man said all he needs now is to see Jesus walk on water. The neighborhood has quieted down. They may have figured out what I have: the Presidential race looks like it will be at least 'til Midnight to call. 11:12 P.M. - It's official: Obama looks like he has enough electoral votes to win. In our neighborhood, the pans were beaten and shouts of "Obama!" went up. On the City side, very interesting. Stay tuned. 12:10 A.M. - I'm going to try to get some sleep. Diezel is winning with just over 50%, as Flores splits off of Jackson. Sessoms is up about 6,500 votes over Meyera. Rosemary is winning on a plurality, as in 2004. The big thing is Glenn Davis is ahead. John Moss is doing better than conventional wisdom, but that means nothing for VBTAers if they wake up with Mayor-elect Sessoms. With Sessoms in the Mayor's Office, the only thing that could stop light rail is the FTA. Simply vote tomorrow and Starbucks will give you a free cup of coffee for the asking. $12 Economy Seats To Europe? Sarah Palin got prank called by a radio duo in Montreal. The vote for Mayor was close. The humorous part: John Moss didn't even show up for an Interview. With The Obama Effect hitting the polls November 4, Moss writes off over 30% of the voters? Even funnier will be the fact that the VBTAers will never figure out how John got creamed. 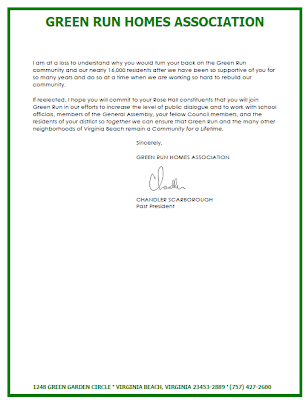 In a letter from the Green Run Homes Association (GRHA), Past President Chandler Scarborough blasted Councilwoman Reba McClanan for her repeated ignoring of questions from the GRHA. Since Green Run makes up a huge chunk of Rose Hall District, Reba's behavior is appalling. 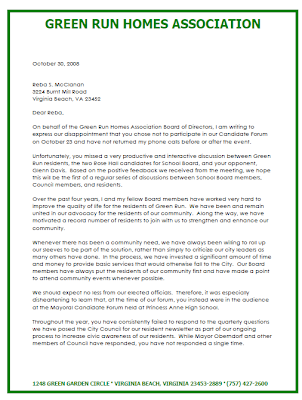 When the GRHA recently had a candidates night, McClanan was off at a Mayoral forum as a spectator. It's not the first time for her: on Day 2 of this year's Council Retreat, McClanan was off speaking to the Virginia Beach Taxpayers Alliance (VBTA) rather than attending to her Council duties. Click on the images for a larger picture. H/T to Michael Ragsdale of HR Transit Ideas for helping me with the PNG. There are those who argue that mass transit can't be done in Virginia Beach. They usually point to either how the city is built or it's demographics. The latter is changing rapidly, while the former is slated to change through the Comprehensive Plan. For those who think it can't be done, bus ridership on Virginia Beach's outlying mainline routes operated by Hampton Roads Transit's (HRT) base here were up this year for the third consecutive Summer. The routes served (25, 26, 27, 29, and 33) had a 5.2% increase for the May 1 - September 30 window over that period in 2007. 88% of voters thought Robert Dean has had a negative impact on conservatism in Virginia Beach, while only 11% said he was a positive influence. The new poll: should Rooms Taxes be included in the Town Center TIF? They're not currently, but Armada-Hoffler has floated the idea for the next phase of construction. FYI this is the 400th post on this blog. 1. An increased number of sponsors to float the group financially. 2. More sponsors willing to sit on the Board of Directors. 3. More sponsors willing to make regular submissions to The Monitor (CACI's newsletter). If the above conditions are not met, CACI may cease to exist. Taking the bus to this morning's TPPC meeting, a postal worker boarded who I recognized as a regular rider. He explained that it was his day off, but that he had been called in to handle political mail. With the election next Tuesday, the United States Postal Service (USPS) is swamped with last minute direct mail pieces. The extra help is needed to get them to you on time. So when you get that glossy in the next few days saying how fiscally conservative the candidate is, remember that the USPS had to pay overtime to get it to you. This morning the Transportation, Parking, and Pedestrian Committee (TPPC) of Virginia Beach's Resort Advisory Commission (RAC) met. The meeting lasted about 80 minutes. At the top of the Agenda was the VBWave seasonal trolley service. After a slow start, it rebounded in August, getting back to 2006 ridership levels. The problem was that September was 42.3% below 2007, with the year ending 28.0% down. Farecard sales were down 31.61% for the year. An attack strategy is being mustered. First, a robust marketing plan for 2009. Second, a survey in early 2009 to find out why people ride and don't. Third, improved signage and amenities. Finally, the trolley fleet will soon be down to 15 vehicles, as the excess trolleys will be auctioned off next month. Hampton Roads Transit (HRT) needs 21 vehicles at peak, so 10 hybrids and 15 trolleys would give them 25 to work with. The Oceanfront Enhancement Committee's (OEC) recommendations on street closings were discussed again. The TPPC sent to the OEC a proposal to cul-de-sac 16th Street just west of Arctic and to implement traffic calming measures on Arctic. The previously approved changes to the Residential Parking Permit Program (RPPP) will go to City Council on November 25 for the required Ordinance change.